Three weeks after our first garlic harvest, it is absolute crunch time to get the remaining quarter or so acres of garlic out of the ground. 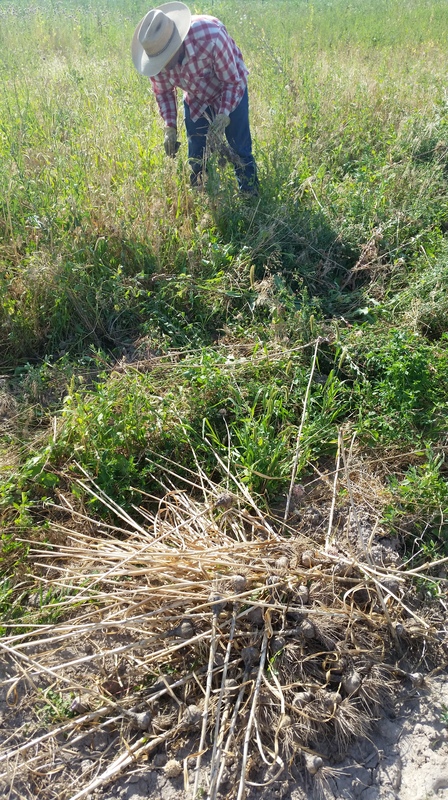 This time there were not near as many caring, hardworking souls willing to volunteer their time to work their behinds off to help us harvest garlic. I can’t say as I blame them either, if I had a choice or someone to go do something with I would have willing to do anything too as long as it didn’t involve garlic. Any guesses how we got the garlic out of the ground; the easy way (mechanically) or the hard way (by hand)? The other half refused to try using the tractor and renovator or cultivator to get it out of the ground. So, of course, that left us with the hard way, the way we do most things and learn on this farm . . . . hand pulling all that garlic one plant at a time. Part of the ground was so hard and crusty the garlic would break off or just stay stuck in the cement like ground. We got out the hose and started running water on the garlic in front of us as we hand pulled it. 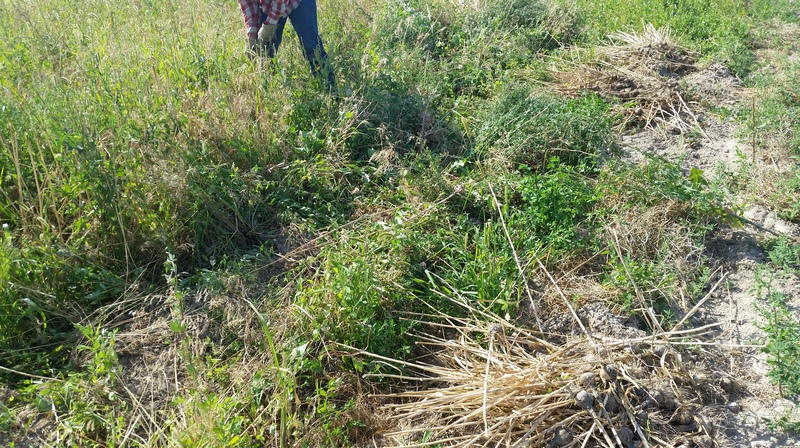 That made it a bit of a mess to trudge up the rows and irritated the arms a bit to have the wet weeds rubbing against our arms and legs. After garlic harvest, part 1, the other half went out with the hedge trimmers cutting off all the garlic scapes. Trying at the last minute trying get a little bit bigger heads. It has been three weeks since our first harvest so the garlic is dried down completely, with sharp jagged tops, now that they have been cut, that snag and scratch the crap out of my arms. I know I could avoid that if I would wear long sleeves, but when it is 100 degrees outside there is no way I will wear anything more than a tank top and shorts. Since I had shorts on the weeds and garlic also scratched and injured my legs. Even with wearing gloves I still ended up with four blisters on my fingers. On the plus side, I discovered that my homemade coffee soap works very good at scrubbing the rough skin off and deodorizing. It gets rid of the garlic smell with one shower. After two full, long days of hand pulling garlic in 100 degree weather, I have blistered hurting fingers, a tired back, scratched up arms and legs and a body that is just plain exhausted and sore.I am so sick of garlic and all the work and heartache that garlic has cost our family. I will not plant another clove of garlic to sell unless the price significantly increases. If the other half decides to plant more garlic, he is on his own. I’m done planting, growing, and harvesting garlic to sell. There is just too much labor involved and there is no way to make money growing garlic without doing it mechanically. Whoever else in world does grow garlic doing the work by hand, my hat is off to you. I’ll leave garlic production to farmers with more money to hire the work done or have a way to do part of it with tractor and machinery. And now it’s time to handle everyone of those individual heads of garlic again . . . . . to cut the head head off and bag the garlic. Needless to say next time I need to buy garlic, I will be more than willing pay an absorbent price for it. I now know the work, sweat, and unpleasantness that goes into planting, growing, harvesting, cutting, and bagging of garlic. It is worth way more than what is sold for, that’s for sure. All organic produce that is grown and harvested by hand is worth more than what is charged for it. Maybe I’ll go into that next week.